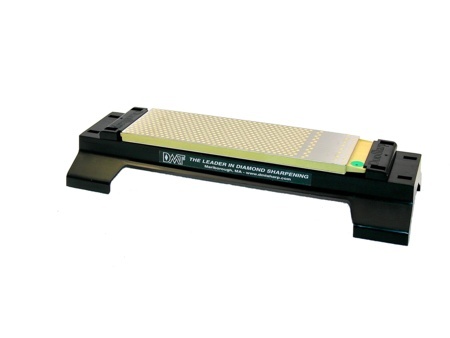 8" DuoSharp®plus™ Bench Stone with Bench Stone Base provides excellent counter and bench sharpening. The stone features two sides of 6" x 2 5/8" interrupted diamond surface sharpening— perfect for knives, scissors, tools PLUS the benefits of a continuous zone for small and pointed tools. Choose from one of the following grit combinations: fine/coarse or extra-fine/fine.